We have a large selection of horses and ponies and take pride in our ability to provide suitable mounts for needs as diverse as a young child, who is experiencing horse riding for the first time, through to those who have owned their own horse - and of course all those in between! 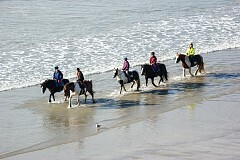 We offer 1.5 hour and 2.5 beach rides, along with or combined with countryside rides. 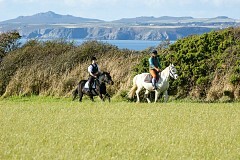 We are well placed to cater for group holidays in Pembrokeshire of up to 30 people - adults and children. 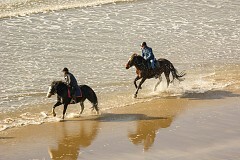 Or you can bring your own horse to stay in our dedicated stables, and ride on the beach. See our Accommodation page for self catering cottages and Glebe House B&B. 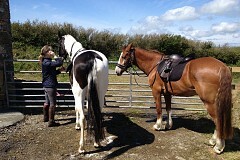 A large selection of horses and ponies give us the ability to provide suitable mounts for all needs. 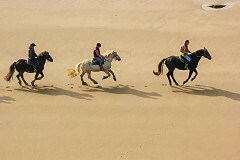 Great value package deals for beach riding breaks. Riding Prices for our Beach Rides, Woodland Rides and Combined Rides. Plus a guide to the ride times. At high tide, when there is little or no beach, our 1 and 1.5 hours rides head to our 35 acre private valley. We can cater for group holidays in of up to 30 people - adults, children, & accommodation. 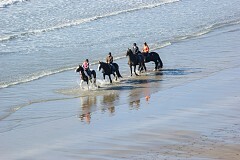 Bring your horse with you and take it beach riding or hacking aross the lovely Pembrokeshire beaches. Morning & Afternoon rides. These times are subject to change according to the tide.